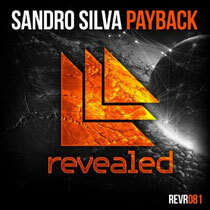 Revealed Recordings’ latest release is from Dutchman Sandro Silva with his track, ‘Payback’. Sandro is still on a high off the back of his platinum-scoping track, ‘Epic’ alongside Quintino, and with his recent club track, ‘Puna’. Premiered by Hardwell during his Tomorrowland set, and having already won plaudits for his individualist approach to the big room electro sound with which he and Revealed Recordings are synonymous, Sandro has already gained great support from scene leaders for his distinct studio approach. He’s already had releases on Dimmak, Mixmash, Ultra and Atlantic Records and DJ sets at EDC Las Vegas, Creamfields, Ushuaia Ibiza and London’s Ministry of Sound. Sandro has definitely made significant inroads into the scene and has fast built upon his early reputation for creating big room tunes. The track is out 11 November, check it out below.